Joint statements on state visits tend to be drab in nature and point 10 of the joint statement after French President Emmanuel Macron's ongoing visit to India seems just as innocuous. But its content is of serious significance to the direction of India's defence strategies, which have long been criticised as convoluted. It reads “The leaders noted ongoing discussions between DRDO and SAFRAN on combat aircraft engine (For details, visit www.mea.gov.in).” Safran, a major French defence and technology supplier, has been attempting to pitch its engine technology to India for more than a decade, in competition with its American and European rivals. These attempts have been aimed at the DRDO's flagging Kaveri project, which aims to develop an engine for the Tejas fighter. In 2008, The Kaveri was officially 'de-linked' from the development of the Tejas, given numerous delays and performance shortfalls and a fresh batch of F404 engines were ordered from GE in the US. GE also won a contract worth $822 million to supply a newer engine, the F414, for the Tejas' projected MK2 derivative; the first two of 99 F414 engines on order reached India in 2017. GE has also touted the F414 for India's future fifth-generation fighter, called the Advanced Medium Combat Aircraft (AMCA), which remains at concept stage. However, work on the Kaveri project still continues. Ten days before Macron's visit, a French newspaper reported Safran was offering its M88 turbofan engine to India to revive the Kaveri project. The M88 powers the Rafale fighter, 36 of which are on order for India and which is at the centre of another political storm. On the face of it, the French offer, valued at approximately euro 1 billion, seems to make eminent sense, in addition to providing a technology boost to DRDO. The M88 is an advanced engine with a modular design, making maintenance easier and increasing operational availability, unlike Russian systems, which currently dominate Indian Air Force service. 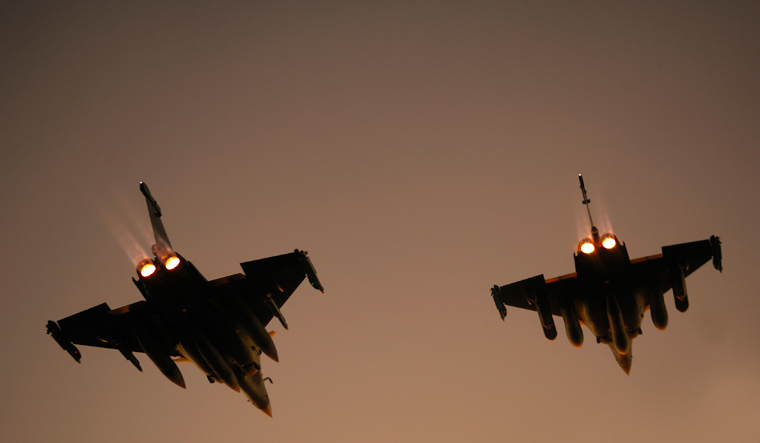 Furthermore, using a common engine type for the Rafale and Tejas would rationalise the Indian Air Force's vast and diverse logistics inventory, improving serviceability of aircraft while also lowering costs, as technicians and engineers would be dealing with common electronics, lubricants and other parts. Pertinently, such an engine deal would also lead to cost amortisation for future Rafale orders—which the IAF has been keen on—and also give the French fighter an advantage in an ongoing Indian Navy competition to buy 57 aircraft. However, embracing such an 'engine deal' should be done cautiously. In its weight category, the M88 competes with the EUROJET consortium's EJ-200, which powers the Eurofighter Typhoon, and the F414; all three systems offer similar features. The French engine has the disadvantage of lower order volumes compared with the other two, and consequently would have higher purchase costs. The F414 engine is regarded as having the lowest purchase cost of the three, as it is in service with the US Navy's Super Hornet fighter and has been ordered by South Korea and Sweden for their future fighter programmes, in addition to the Tejas MK2, as mentioned previously. With the US Navy and South Korea expected to use the F414 for decades, its 'growth' potential is considerable and the large order volumes would mean the engine would have a competitive price. Another factor going against the French offer is how, or when, exactly an M88-powered Tejas will fructify would be difficult to envisage as the current set of 123 fighters intended for purchase by the IAF are powered by the American F404 engine. With development of the Tejas Mk2 proceeding slowly, modifying the fighter for a totally new engine is expected to lead to even more delays given the need for testing and possible design changes to its air intakes and fuselage. An optimistic in-service date for such an M88-powered Tejas variant would be well past 2025, by when the type's basic design would be obsolete. While it can be argued that the M88 could be used for the AMCA, the level of IAF and government commitment to that programme remains unclear. Therefore, it would be prudent to argue that deal to buy or co-develop Safran engines for the Tejas will help boost Rafale sales more than it would assist India's indigenous programmes.